Return pork and garlic to pot. Add milk, sage, chiles, and lemon peel. Transfer pot to oven and bake, uncovered, turning pork every 30 minutes, until meat is very tender and can easily be pierced with a paring knife and milk has reduced and formed curds, 2½–3 hours. Transfer meat to a cutting board and let rest 15 minutes. I just spent three days in Chicago—aka the meatiest city in America. And somehow, all I came home thinking about was vegetables. Chicago is the birthplace of Morton’s The Steakhouse. It’s where our own Alex Delany, clearly ignoring his doctor’s advice, once downed 14 of the city’s signature hot dogs in a single day, all for some YouTube glory. And it’s home to the famed, giardiniera-soaked Italian beef sandwich. But during my weekend at Bon Appétit’s annual Chicago Gourmet festival, I managed to actually get kinda healthyish. On Day 1, I had lunch with our deputy editor Julia Kramer. We went to Cellar Door Provisions, which is one of those all-day bakery/cafés where you want to order everything on the hand-written menu. So that’s exactly what we did. We got the quiche, which is so cloud-like, so ethereal that it defies baking logic (or at least the name quiche). We got the house-baked sourdough, which comes with a little football of fancy butter, crowned with flakes of sea salt. And we ordered an apple-kohlrabi salad, which is exactly the kind of thing I want to eat all fall long. It’s crisp and bracing, like one of those October days that snaps you to attention as soon as you walk outside. 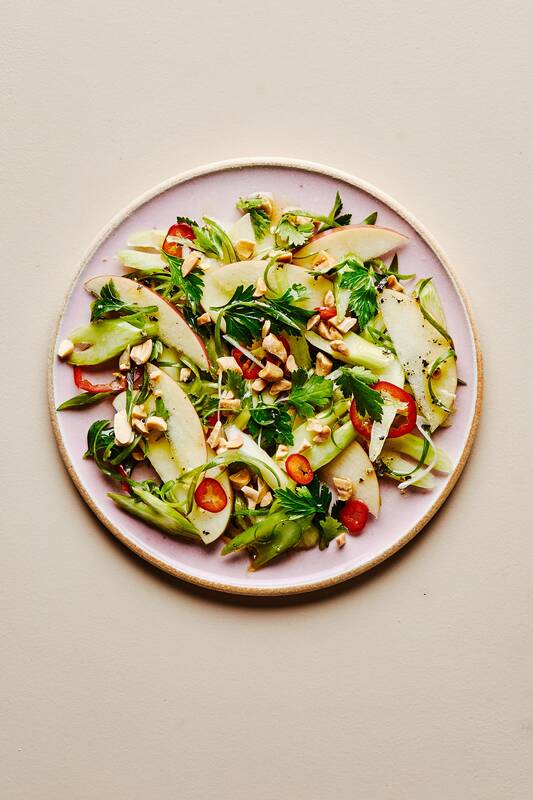 And it’s a lot like this apple-celery-peanut salad (from Josh McFadden’s cookbook Six Season) that we have on our site. Both rely on a mandoline (or at least some deft knife skills); both mix fruit, veg, nuts, and herbs; and both turn to a sharply acidic dressing that brightens each ingredient without overpowering it. Give me some braised short ribs for dinner, and this is exactly the kind of salad I’m serving alongside. The next day, at the festival in Millennium Park, I hosted a demo on the main stage with Emily Fiffer and Heather Sperling from Botanica in LA. They made this dead-simple-but-intensely-flavorful roasted carrot dish, one that balances spice with sweet. To make it, they halved some farm-fresh, multi-colored carrots lengthwise, and then they tossed them in a bowl with olive oil, salt, a few generous dashes of smoked paprika, a sprinkling of cumin seeds, and a drizzle of maple syrup (though you could also use honey or agave syrup). Then they added some halved lemons and oranges and few unpeeled cloves of garlic. Onto a sheet tray it all went, both fruit and veg cut-side down, into a 425° oven for 15–20 minutes ‘til all caramelized, roasty, and delicious. Squeeze the warm citrus all over the carrots and top with some chopped cilantro. It’s that simple. But, if you prefer a proper recipe, I’d recommend this one for harissa-roasted carrots with maple syrup, which is real similar and just as tasty. A few hours later, I did another demo with Carla Hall and Timon Balloo, chef of the Caribbean fusion restaurant Sugarcane. Timon whipped together two quick pickles, which made me wonder why I don’t make them more often. 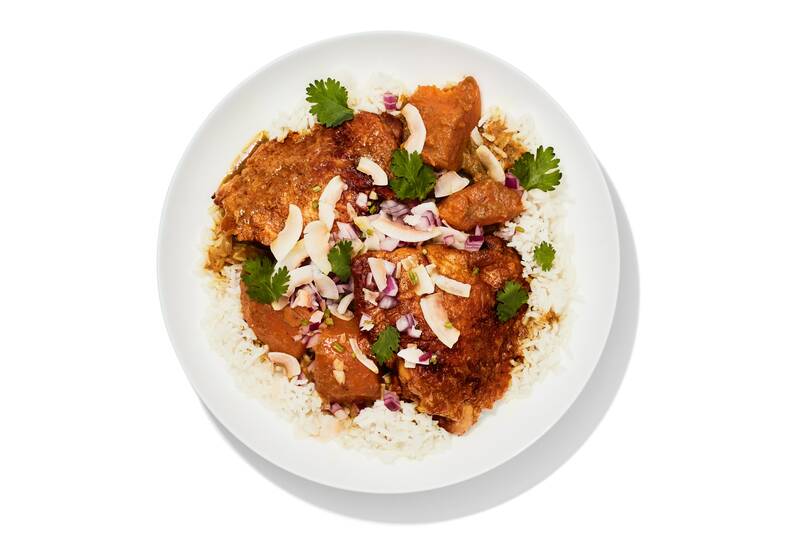 They couldn’t be easier and they’re the kind of thing you can keep in your fridge and reach for anytime you want to amp up an otherwise ho-hum meal. One was a Thai-style pickle, hopped up with fish sauce, palm sugar, and fresh ginger. I immediately asked him for the recipe and, hopefully, I can convince our test kitchen to give it a spin. The other was a classic cucumber pickle. Toast some whole spices—coriander, mustard seeds, you name it—in a dry pan, add some water, vinegar, sugar, and salt to the pan and bring to a boil. Pour it into a jar of just-sliced cucumber spears, fresh herbs (like dill), and sliced onions. Done. Munch on them for weeks to come. No, this wasn’t the Chicago I expected. But it’s one I’m happy to take home with me. Okay, this is going to seem a little bit out there, but trust us: It works. Place a cold, dry large Dutch oven on the stove—no heat yet! Nestle all of your chicken thighs in there, skin side down, so that there is as much skin-to-pan contact as possible (it’s fine if they’re crowded together). Then turn the heat under the pan to medium. As the pan becomes hotter and hotter, the skin will start to release some of its fat and then get extra crispy and brown, a process that will probably take around 15-20 minutes. (Try not to fuss with the thighs too much while this is happening, just let them be. This is a good time to do some of the prep work outlined in the next few steps.) When the skin is deeply browned—we’re only cooking the skin side right now—use tongs to transfer the thighs skin side up to a plate. Turn off the heat under the Dutch oven, but reserve it—we’re going to build our braise in it, and we want all of that fat and any browned, stuck-on bits, which will lend richness and flavor to the finished dish.